Live on the edge of it all at Camden Fairview located in the SouthPark neighborhood of Charlotte, nearby SouthPark Mall and Uptown Charlotte – with fine dining, shopping, and entertainment right at your fingertips. Inside our one and two bedroom apartment homes, you’ll find custom details that are the perfect match for your lifestyle. Featuring stainless steel appliances, custom cabinets with soft close drawers, oversized kitchen sinks, designer lighting, crown molding, vaulted ceilings, wood-burning fireplaces, USB-enabled outlets and washer and dryer included. Enjoy views of lush landscaping in addition to conveniences like door-to-door waste and recycling pick-up service and 24-hour emergency maintenance. Residents receive a technology package included in the total monthly rent with a savings of up to 48% off retail. This money-saving package includes high-speed internet up to 300 Mbps and 225+ channels including over 120 HD channels and HBO. Looking for more options? Access Spectrum and HBO Go from your smart device + over 250,000 Spectrum WiFi hotspots nationwide. Relax by a pool that fits the definition of resort-style, featuring a WiFi enabled cabana with bar and refrigerator, grilling area, flat screen TV, outdoor fireplace, game space with ping pong and corn hole. Break a sweat in our state-of-the-art fitness center with TV, filtered water, towels, cardio and weight training equipment or get some work done in our resident business center. Your pets will love it here too, especially if you utilize our fenced in Dog Park with agility equipment and benches. Additional amenities include a resident lounge with flat-screen TV, car care center, furnished guest suite, and storage spaces. Camden Fairview is also currently in process of becoming a completely non-smoking community. Come home to Camden Fairview today! Get the perfect spot! 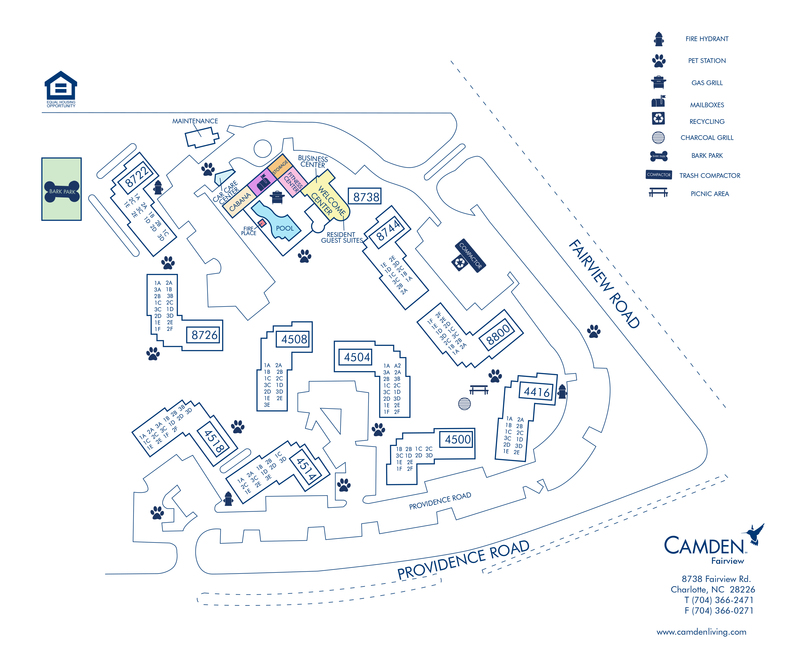 We have ample parking for our residents and visitors on a first-come, first-served basis. Storage is available to rent for $35 per month. Please call us for details!